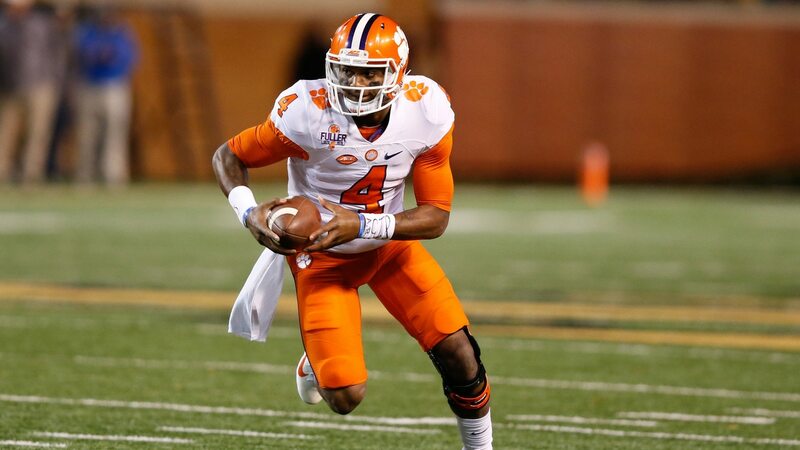 Can champ week contenders catch Jackson for the Heisman? Lamar Jackson ranks second in total offense with more than 400 yards per game. Lamar Jackson stumbled down the stretch, leaving the rest of the field one last chance to catch him in the Heisman Trophy race. An avalanche of sacks and turnovers the last two weeks have taken some of the luster off an otherwise spectacular season for the Louisville quarterback. His numbers still stack up with the best in the country this season and some of the best in recent college football history. But he has been on the losing side of his final two regular-season games and no player who has won the Heisman has picked up the trophy on a two-game skid since Tim Brown of Notre Dame in 1987. Working against Jackson is that on championship weekend, when there are few games and many Heisman voters are paying closer attention than they have all season, he is out of the game. Meanwhile, Clemson's Deshaun Watson, Washington's Jake Browning and Oklahoma's Baker Mayfield and Dede Westbrook are playing in high-stakes games, with a chance to make lasting impression. Ballots are due Monday and the finalists will be announced later that same day. The ceremony is Dec. 10. Jackson still leads the AP panel's voting in the final Heisman Watch of the season. The only difference this week is that for the first time, he did not receive all seven first-place votes from the panel. He got six. (First-place vote = three points; second-place = two; third-place = one). Number to know: While Jackson is the seventh FBS player to ever reach 20 touchdowns scored and 20 touchdown passes in a season (including three Heisman winners in Tim Tebow, Cam Newton and Johnny Manziel), he is the first to reach 20 touchdowns scored and 30 touchdown passes in the regular season. Number to know: Watson is closing strong, much as he did last season. The competition has not been the best, but in his last four games Watson has completed 76 percent of his passes, with 12 touchdown passes and four interceptions (three of which came in the loss to Pitt). Next: vs. No. 19 Virginia Tech in the ACC championship game Saturday. The Hokies are fourth in the ACC in defense, allowing 4.89 yards per play. Number to know: Eleven of his 15 TDs from scrimmage have covered of 40+ yards, the most by any player since 1998. Next: vs. No. 10 Oklahoma State for the Big 12 championship Saturday. The Cowboys are tied for fourth in the Big 12 in pass defense, allowing 7.3 yards per pass attempt. Number to know: Browning is second among Power Five quarterbacks with 40 touchdown passes. He has one fewer than Texas Tech's Patrick Mahomes, who has thrown 262 more passes. Next: vs. No. 9 Colorado in the Pac-12 championship game Friday. The Buffaloes have the No. 1 pass defense in the Pac-12 by yards allowed per pass (5.4) and passer efficiency rating against (97.65). Number to know: The best player on the No. 1 defense in the country, allowing 3.96 yards per play, and a total of 824 yards rushing. No other team has allowed less than 1,175 yards rushing. Next: vs. No. 15 Florida in the SEC championship game Saturday. The Gators are second-to-last in the SEC in offense, gaining 5.27 yards per play. Number to know: Leads the nation in yards per attempt (10.9) and passing efficiency (194.7). Next: vs. No. 10 Oklahoma State for the Big 12 championship Saturday. The Cowboys are fifth in the Big 12 in defense, allowing 5.77 yards per play. Number to know: Cook has rushed for 160.8 yards per game against four ranked opponents, the most of any Power 5 player.